French food is hardly a novelty in New York, especially in Manhattan, but finding an un-fussy, un-pretentious joint absent throngs of girls-in-heels increasingly is. In such trying times, it’s important to remember those who came before the recent outbreak of trendy French restaurants and who continue to do it right. La Sirène has been open since 2008 and has expanded, changed, and created spin-offs, yet has managed to remain a cult favorite among those who have been eating there for years. In its early days, La Sirène was a tiny BYOB restaurant in the southwestern no-man’s land of SoHo. Today, it has taken over an adjacent storefront and started serving wine and liquor, but the original charm remains, thanks to chef/owner, Didier Pawlicki, who came to New York from Provence. Didier is obsessed with internet feedback and puts commentary on his menu like, “This cassoulet is a Very Rich Dish which was served for Warriors to defend their Village! Don’t take it if you can’t bear it :)”. So, yeah, now you know that. The intimate and feisty atmosphere suffered a bit once they expanded, and their new wine list isn’t an improvement from their long-held BYOB policy, but overall, the vibe at La Sirène is still the same - it's charming and a little bit funky. As for what to eat, the menu here is generally solid, minus a few misses. Sure, there is probably better French food in NYC, but La Sirène is pretty damn good and pretty damn authentic. Imagine walking into an undiscovered bistro somewhere in Provence, and having a, “THIS IS FRANCE” moment. You can have that moment here too, as long as you can block out the actual tunnel vision right outside the window and focus on appreciating the classic French flavors instead. Plus, sometimes you just want a hyperactive and passionate Provençal man to serve you the best profiteroles you’ve ever had in a strange corner of Manhattan, and you want to avoid banker bros while doing so. This is your place. A must order for every visit to this restaurant, unless you’re one of those sad goat cheese phobes. It comes with a mixed greens and mango salad, and is everything a goat cheese tart needs to be. It’s big, so broker a deal with your dining companion. A serviceable classic. There are better starters on this menu, but if you can’t go without ordering French onion soup, this will hold you over just fine. Roasted in butter sauce with breadcrumbs, there are better versions of escargot out there, but this also won't let you down. Order it if you’re into snails. I’m ashamed to say I like this, because I suspect it involves the great mirage of all trendy food products: truffle oil. Apart from that lame detail, tiny ravioli are served in a cocotte with truffle cream sauce, and honestly? It’s delicious. Forgive me. A specialty of the house are the four various mussel dishes. The mussels La Sirène uses are fresh and large, and the white wine and herbs version showcases this best, as the broth isn’t too overpowering. The curry mussels are another favorite, albeit stronger. A crowd favorite that has survived all iterations of the menu, probably because it’s perfect. The steak is sautéed in butter, garlic, and parsley which certainly doesn't make it taste worse. This dish is on the menu year-round, but you should probably wait for temperatures to drop to eat it. Unless eating a personal pot of slab bacon, duck fat, duck confit, foie gras jus, pork sausage, and quail stock in the middle of August sounds awesome to you. If so, do your thing, and might we suggest some exercise. The duck rotates between being served with a chocolate sauce or cherry sauce. Both are good, but the cherry is better. A good substitution if you’re craving duck but can’t handle the blow of the cassoulet. If you’re feeling masochistic and have already done the cassoulet, consider this dish. This is basically filet mignon with a slab of foie gras in a port and red wine truffle sauce. “Tournedo Rossini” refers to a lean cut of beef, and not actually a “tornado of fat”, but the latter is more apt. It’s intense, in a good way, and has been a long-standing fan favorite. Complimentary with your meal is a serving of three or four vegetables. Usually, this consists of roasted squash, cauliflower puree, sweet potato puree, and something else. Thanks to a healthy dose of butter, they are really, really good, and you don't even have to worry about ordering them. All you have to do is eat and be happy. These are the best profiteroles in the world. That is all. 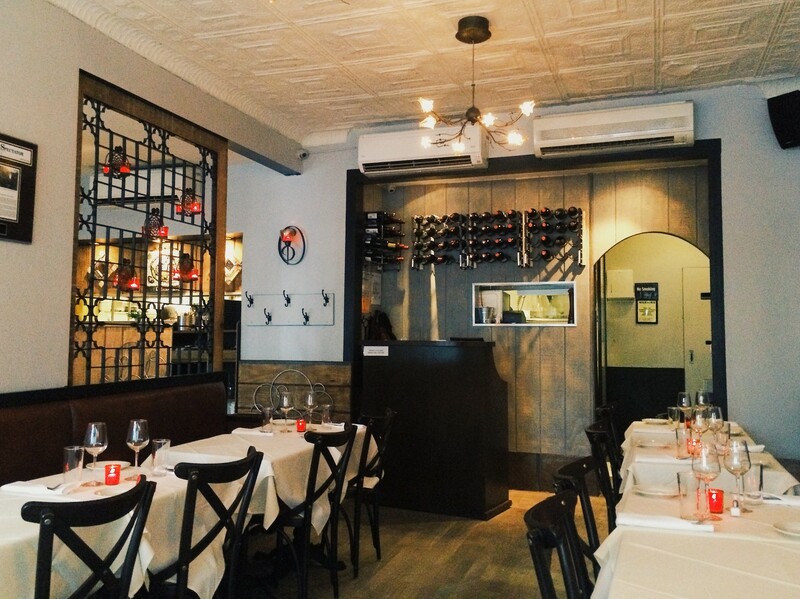 A fancy neighborhood restaurant serving very good French and Italian-inspired food. A classic West Village brunch spot that people line up for.